On my YouTube channel, I introduced a website called Humanatic, which is a legitimate opportunity for those looking for an easy way to make money online. Humanatic pays members to sort random phone calls from the comfort of their home. It is also recommended for stay at home parents because you won't need to worry about the background noise while you work. In this post, I have shared a complete review about Humanatic and how to get started. 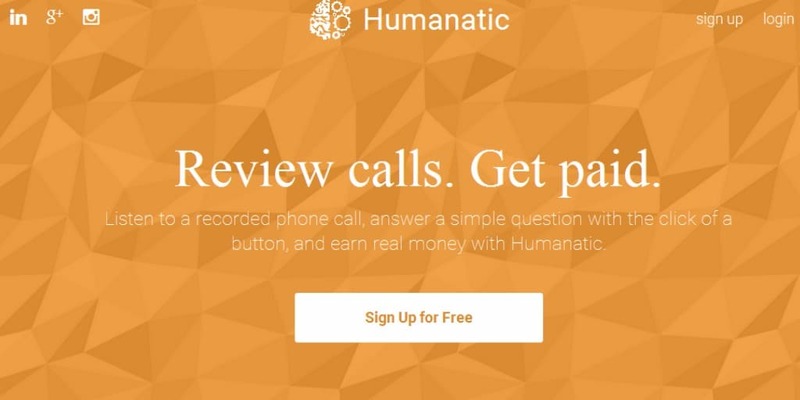 Humanatic is a website, developed by a company called Century Interactive that recruits independent contractors to listen, review, and sort phone calls. These are calls that need to be examined for quality assurance from various businesses. So, it's a big help if the call is already sorted and tagged to the right category. As a contractor, you are called Humans and will need to listen to calls and place them in the right category. It is very important to listen carefully so the recorded call can be marked properly. This will help you get a high accuracy score and also higher paying tasks. Humanatic doesn't require any special training or prior experience for the job. It is a simple job that requires patience and a good attention to detail. The pay depends on which call category you choose. The lowest category can start as low as $0.06 -$0.10 per call task. Your accuracy will result to higher pay.It depends on which from categories listed you choose. Humanatic does require you to have a Paypal account to receive your earnings. Payments are made weekly, every Monday as long as you have accumulated $10 on your account. I have to say I enjoy listening to phone calls. It's very fun and flexible work that is simple to do. It can definitely improve your judgement and listening skills. For those that would recommend a job that doesn't involve talking on the phone, this could be an ideal choice. The pay is very low. Due to the high number of humans evaluating calls – most times the call volume can be slow. Do not rely on this as a consistent income. Another issue is sometimes it can take forever to receive the confirmation email. For me, I received mine within a few days, but lately other have complained about it taking months. The last downside is there is no training on how to complete the tasks. So you must be able to guide yourself through the process, and listen to the sample marked calls. Want to get started? Fill out their short online application here. So overall, I would highly recommend Humanatic as a legitimate way to make money online. This is by far not a job, however I am really glad I found out about Humanatic and will be including it in my list of side eggs. Hi Valencia! Thanks for the update. I will update this info. Thanks! Hi Bridget! Unfortnately I am not working with Humanatic at this time due to my schedule. Was there something you were interested knowing about the company? Downside is that Humanatic charges penalties for incorrect calls(evens ones you made correct). You have to dispute them. Lastly if auditing calls fall under a certain percentage, they take away categories. If you are good at certain categories, work the easy ones first. Some categories can open up new categories. i want to follow up my application for Humanatic already submitted last week… Please accept my application.. thank you! very much appreciated if I work immediately. What is difference in OUTBOUND and INBOUND? What should I do if caller messaging to remind their phone number in a call, what should I select in option. I am new here plz help!! Hi there! I apologize for the late reply. Inbound means someone is calling you. Outbound means you are calling someones else. Hope this helps! Hello, I want to earn at Humanatic but my English is not so good, is there any matter of English understanding? Hi! Yes as long as you have a good understanding of English you should be good. I worked for Humanatic for a few weeks and earned some cash. But now when I try to login in with the correct login information, it won’t let me in. Do you know of a way that I can contact someone at Humanatic with this problem? Thank you so much. Hey Holly! I’m sorry to hear that. You should try reaching out to them by email here ([email protected]) or you can message them on Facebook https://www.facebook.com/HumanaticCallReview. Hope this helps! Signed up and got the welcome email in a matter of minutes. started working right away. thank you. I clicked on the video and it says it was removed. Hi Courtney! Yes unfortunately Humanatic wanted me to remove the video from my YouTube channel, since it showed confidential information. If you need additional help, I will be glad to help!